Spain’s capital is a city of beautiful boulevards, world-famous cultural attractions and gastronomic delights. Here’s how to make the most of Madrid in 48 hours. The best way to start your city break to Madrid is to see it from above, so make sure your first stop in Madrid is CentroCentro, a contemporary art space housed in the Cybele Palace. The palace’s tower has a glorious viewing point (lifts are available) from which to take in panoramic views of the city below. Spend up to half an hour here to soak it all up. The tower is open Tuesday to Sunday from 10:30 to 14:00 and 16:00 to 19:30. Entry costs €3. Just a short walk from the Cybele Palace is Buen Retiro Park, one of Madrid’s largest and oldest parks, dating back to the 1600s. There is an astounding variety of things to see here, including sculptures, monuments, galleries, a palace and a lake. To immerse yourself in the feeling of one of Madrid’s favourite places, stop for a coffee and lunch at Bar Mirador, overlooking the lake in the heart of the park. It’s easy to while away a couple of hours here. From the centre of Buen Retiro Park, make your way to Madrid’s so-called Golden Triangle of Art on foot, located on the Paseo del Prado. It’ll take just ten minutes to walk to this spot from the park and you’ll find yourself on one of the city’s most famous and historic boulevards, complete with pretty tree-lined pavements and a number of Madrid’s most famous attractions. Within these well-known attractions is the Golden Triangle of Art, consisting of the Prado Museum, the Reina Sofía Museum and the Thyssen-Bornemisza Museum. Spend an hour in each museum to get a feeling for each place, or choose one to spend a perfect afternoon surrounded by your favourite type of art. The Prado Museum is Spain’s most prominent art museum – home to a collection of European art that dates as far back as the 12th century. Founded in 1819, the museum displays more than 1,000 pieces of artwork at any one time, including paintings, prints, sculptures and drawings. 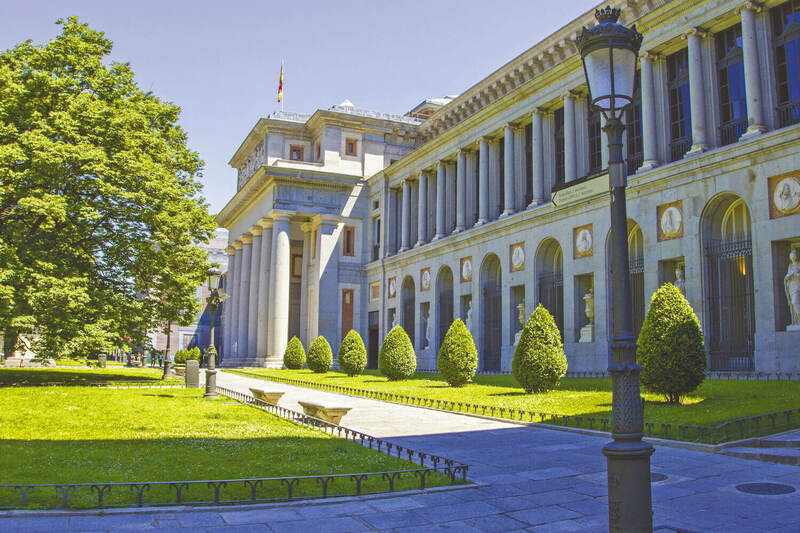 The Prado Museum has numerous works by the Spanish romantic painter Francisco Goya, as well as art by a range of other well-known artists, from Peter Paul Rubens to Titian. The Prado Museum is open from 10:00 to 20:00 Monday to Saturday, or 10:00 to 19:00 Sundays and holidays. The general admission price is €15. The Reina Sofía Museum is Spain’s national museum of 20th century art. A more modern museum than the Prado, having only been inaugurated in 1992, this museum focuses almost entirely on Spanish art. In particular, there are plenty of works to be seen by Spain’s most celebrated 20th century art masters – Pablo Picasso and Salvador Dalí. The Reina Sofía Museum is open from 10:00 to 21:00 on Mondays and Wednesday to Saturday, and 10:00 to 19:00 on Sundays. The general admission price is €10. Originally the private collection of Henrich Thyssen, the German-Hungarian Baron and entrepreneur, the Thyssen-Bornemisza Museum opened in the 1990s to make this extensive range of 1,600 paintings open to the public. This is the place to find Impressionist and Expressionist art, as well as works by Italian, English, Dutch and German artists. The Thyssen-Bornemisza Museum is open from 12:00 to 16:00 on Mondays (free entry) and 10:00 to 19:00 from Tuesday to Sunday. The general admission price is €12. Before dinner, head back to your luxury Madrid hotel to relax. 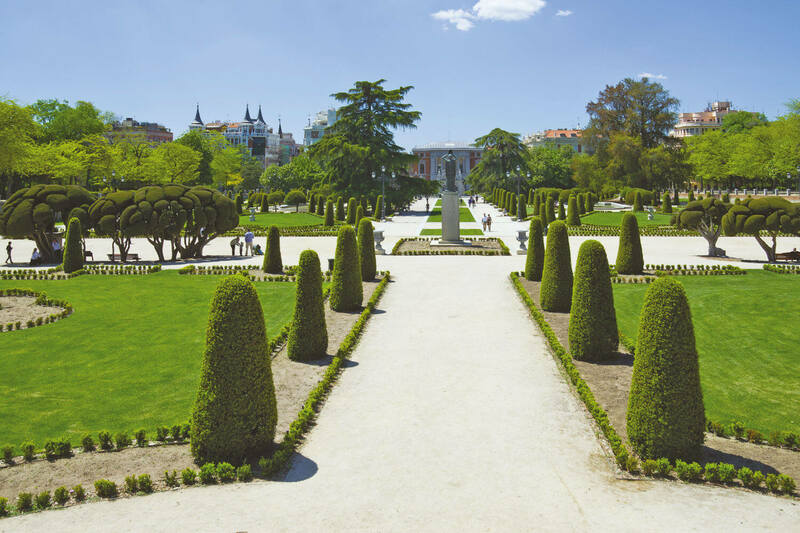 Or if you’re feeling energetic, stay in the area of the Paseo del Prado to spend an hour strolling through the Royal Botanical Garden of Madrid. The entrance to this 20 acre site is next door to the Prado Museum and is a true delight for all the senses. There are around 90,000 plants and flowers and 1,500 trees to take in, including aromatic, ornamental, endemic and medicinal gardens, as well as various greenhouses and a herbarium. 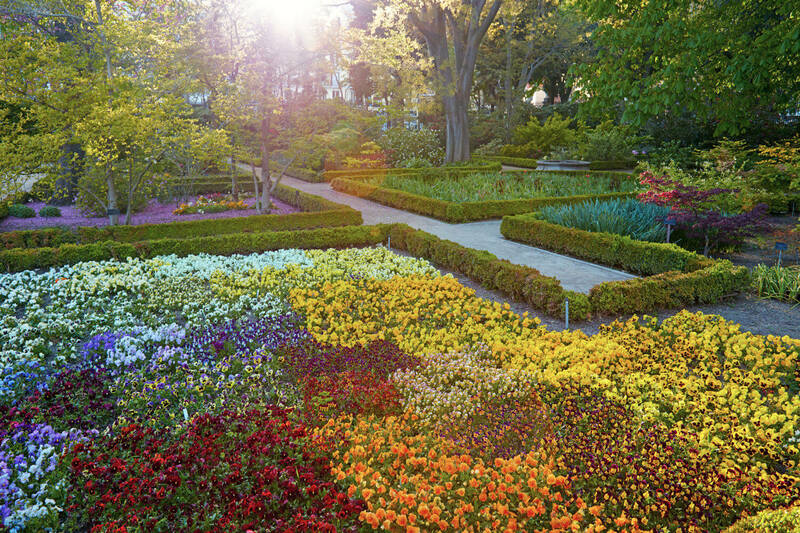 The botanical garden opens daily at 10:00 and closes between 18:00 and 21:00, depending on the time of year. General admission also varies between seasons, but is usually around €6. For dinner, enjoy an authentic Madridian experience by visiting a number of tapas bars and trying the house speciality in each place. One of the best localities to do this in Madrid is the neighbourhood of La Latina, which centres on Calle Cava Baja. You can try all kinds of Spanish tapas here with local drinks too, from sherry to sangria. If you’re travelling here from the botanical gardens, take the metro from Atocha to Tirso de Molina (4 minute journey time) or the 26 bus from Desamparados to Tirso de Molina (7 minute journey time). 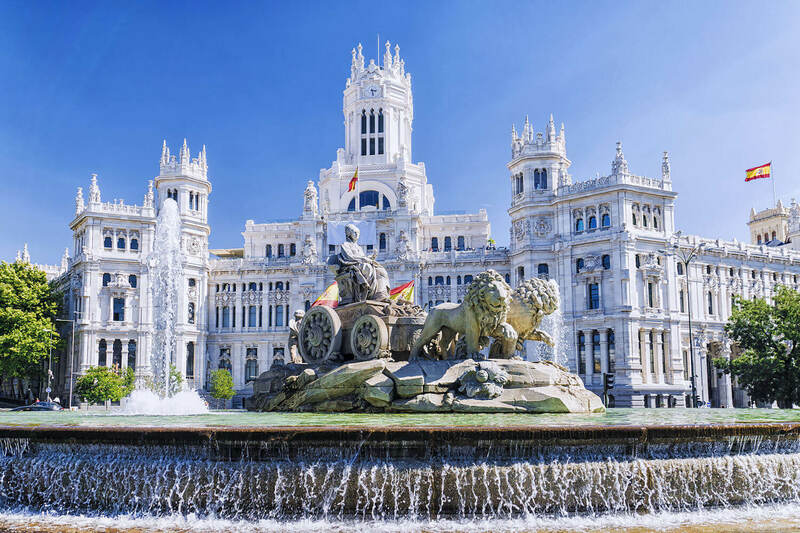 After a first day focusing on art, gardens and culture, it’s time to explore Madrid’s architecture and culinary delights on your second day in the city. The centre of the city is widely known to be the square at Puerta del Sol, so this pedestrianised area is a great place to start your day. 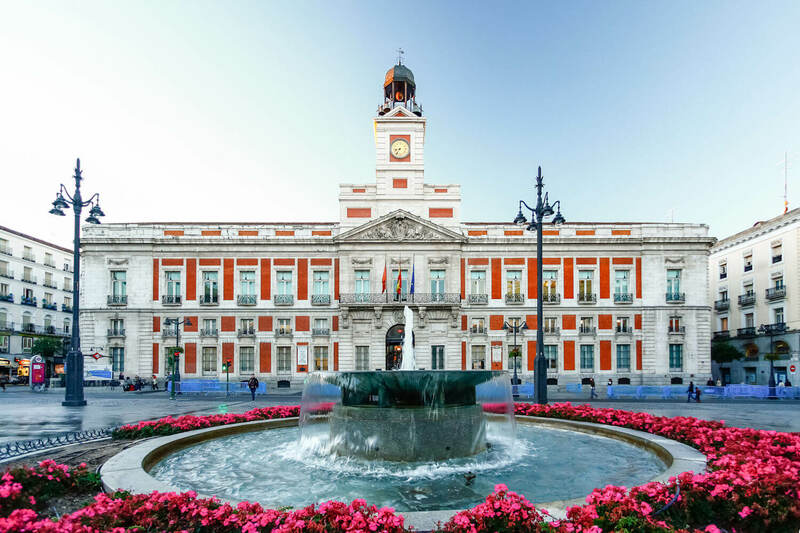 Spend half an hour taking in the sights of the old Post Office – now the Madrid President’s office – and the kilómetro cero plaque on the ground nearby, which is the location of the symbolic centre of Spain. Much of the architecture of the square dates back to the 1700s, when King Charles III had the beautiful plaza built. 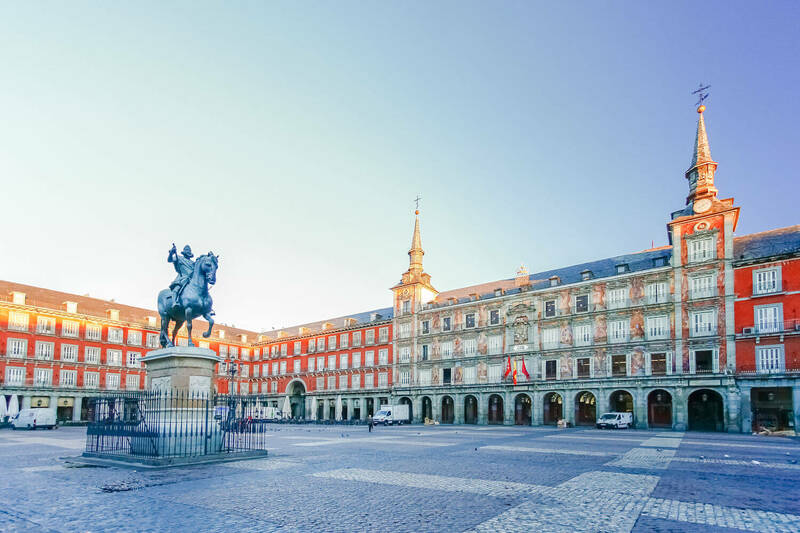 Just a five minute walk from Puerta del Sol is Plaza Mayor, an impressive and perfectly rectangular square that dates back to the 1500s. There are plenty of statues to take in here, as well as pavement cafés ideal for coffee and people-watching. If you’re feeling hungry, Plaza Mayor is the centre of one of Madrid’s food specialities – the calamari sandwich – which is comprised of fried squid rings served in crusty bread. After spending an hour or so in Plaza Mayor, the Almudena Cathedral is a further five minute walk away. Embodying Neoclassical, Neo-Gothic and Neo-Romanesque architectural styles, this cathedral is as fascinating to explore from the outside as it is the inside, which also has a museum. Spend an hour in the cathedral and museum, which is open Monday to Saturday, 10:00 to 14:30. The standard price of entry is €6. 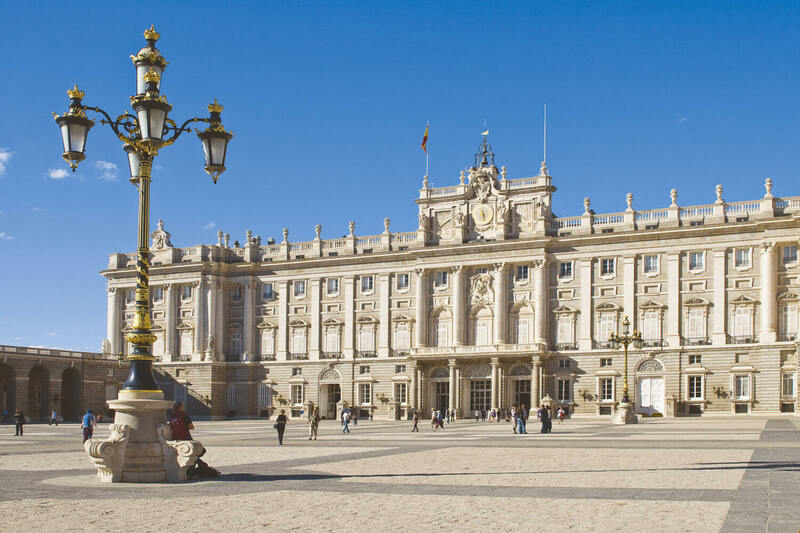 Neighbouring the cathedral is the Royal Palace of Madrid, the largest royal palace in Europe by floor area. The interior is a haven for history, architecture and art lovers, with works by artists such as Caravaggio and Goya on display. It’s worth spending at least an hour or two hear to soak it all up. The palace is open to visitors daily from 10:00 to 18:00 (winter) or 20:00 (summer). General admission costs €11. If it’s a Sunday or public holiday, be sure to pay a visit to El Rastro – Madrid’s oldest street market in the neighbourhood of La Latina. This open air flea market on Plaza de Cascorro and Ribera de Curtidores has everything from hand-made crafts to wonderful antiques. Whether you’re buying or browsing, it’s the perfect way to enjoy a time-honoured Madridian tradition, whether you’ve got half an hour or a few hours to spare. From the Royal Palace of Madrid, reach El Rastro by taking the metro from Opera to La Latina, which takes two minutes. For a late lunch, make your way to Antón Martín Market – just a ten minute walk from El Rastro or a seven minute metro journey from the Royal Palace to Carrera De San Jerónimo station. 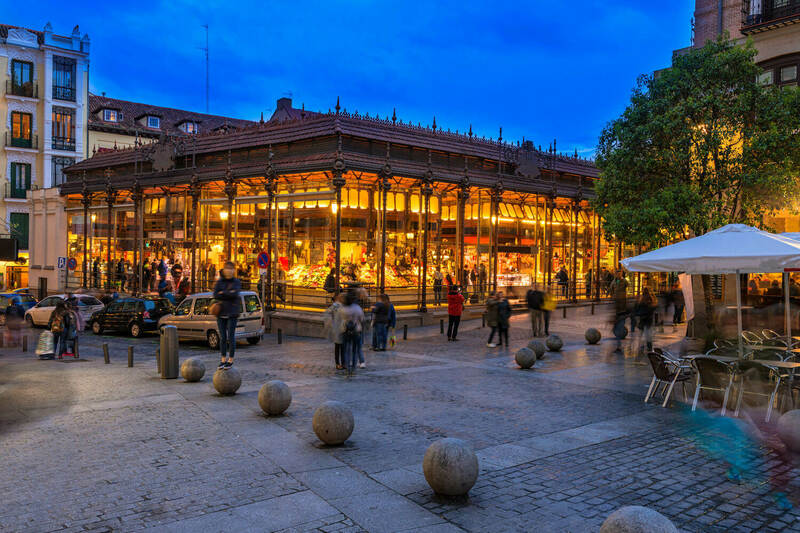 This is a spot to enjoy the feeling of one of Madrid’s most traditional food markets. Donde Sánchez is the perfect low-key eatery to stop for a wine and tapas lunch. A fantastic selection of wines are available to try by the glass and pair perfectly with cheese, cured meats and pâtés sourced from some of Spain’s best food producers. You can even buy a bottle of your favourite wine to take home with you. Spend an hour or two – time can quickly disappear here. Donde Sánchez is open Monday to Friday, 11:00 to 21:00 and Saturdays, 11:00 to 16:00. Alternatively, if you want to stop at one of the most popular markets for foodies in Madrid, make your way to the nearby Mercado de San Miguel instead. A range of high-end food is available from the stallholders at this gourmet tapas market, ranging from caviar to sushi. Mercado de San Miguel is open from Thursday to Saturday, 10:00 to 02:00 and Sunday to Wednesday, 10:00 to 00:00. At this point, you may wish to do as the locals do and head back to your hotel for a well-deserved siesta. Alternatively, indulge in a spot of shopping in the city by making your way to the flagship store of El Corte Inglés on Calle de Raimundo Fernández Villaverde. The world’s largest location for the Spanish department store that has gone global, this flagship store sells everything from books and homeware to high-end fashion. For an evening meal to remember in Madrid, book a table at Restorante Botín near Plaza Mayor. This former favourite of Ernest Hemingway is the oldest restaurant in the world according to the Guinness Book of World Records. Open since 1725, this is a Madrid institution, with the option to dine in the mood-filled vaulted cellar downstairs. Specialising in Castilian cuisine, the restaurant is particularly well-known for its suckling pig and roast lamb. If you’re travelling here directly from El Corte Inglés, take the intercity train from Nuevos Ministerios to Sol, which takes just five minutes. Restorante Botín is open daily from 13:00 to 16:00 and 20:00 to 00:00. 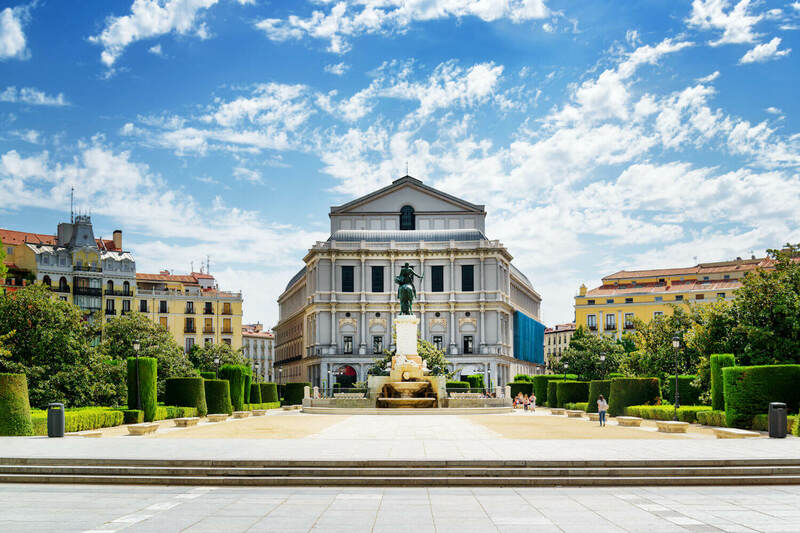 If you’d prefer to soak up a little more culture on your final evening in Madrid, book tickets to the opera instead, which is also near Sol station. Teatro Real is Madrid’s major opera house dating back to 1818. While the building itself offers an impressive slice of Madrid history, the performances rival international opera houses, with shows usually starting at 19:00 or 20:00. Do as the locals do and watch a performance before having a late dinner in one of the many surrounding restaurants. Booking with Classic, you’ll benefit from our free concierge service, which can come in handy to secure opera tickets or restaurant reservations ahead of your arrival. Our reservations team will also find you the most suitable flights and hotel, and a private transfer from the airport will be waiting for you on arrival, to take you to your hotel.